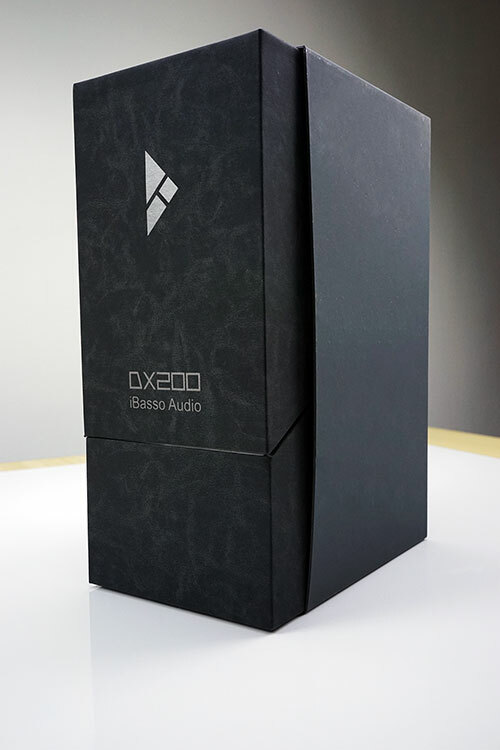 iBasso celebrated their 10th anniversary very recently and the launch of the feature packed DX200 has been timed to coincide with that landmark moment. 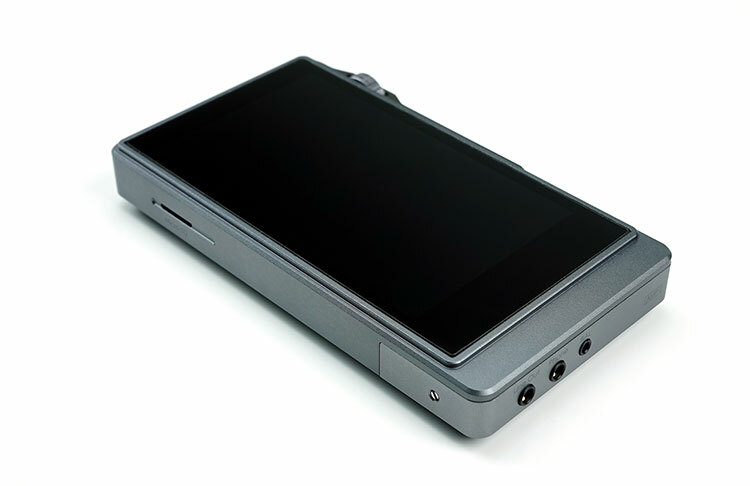 Those of you who remember the DX100 had been waiting patiently for a true flagship DAP from iBasso for quite some time. The DX80 was a little bit of a precursor of what to expect with the Mango OS making its debut appearance at a mid-fi level and we all were teased with the excellent crowdsourcing process in terms of design choice for the DX200 over a year ago. Truth be told I have had the DX200 since February and I was all set to review it in March or April but when I got wind of the Amp 2 module I decided to delay until I could listen to both amp cards side by side and let you know if it was worth the upgrade or not. Let me cut a long story short. It is priced at $869 direct from the iBasso store as of today and I think at that price point it is one of the best value flagship DAPs in the market for a ton of reasons. The big selling point of the DX200 is the DAC chip inside. Utilizing not one, but two ES9028PRO chips is unique in the DAP market today. No one else is doing this right now. These chips are vastly more expensive than the AKM variants being used by the likes of FiiO, Cayin even up to the AK380. Sure enough, chips are not everything but iBasso have been using Sabre chips before in their successful DX90 series and at the time it sounded fantastic. The DX200 also comes with a vanilla bloatware-free Android 6.0 experience slapped onto a more than capable Arm Cortex-A53 CPU and 2GB of RAM. The only additional is the Mango app and even then you do not have to use it, you can simply download your own app as per any other Android experience. Most DAPs in the market today tap out at 5.1 Lollipop, very few if any are this far advanced in their platform setup or this open. 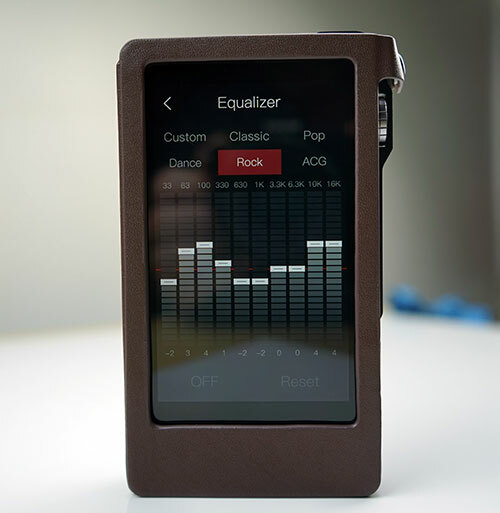 You can also dual boot into Mango as the sole OS much like FiiO for a dedicated music player experience. iBasso is also pitching a modular amp card system as a big selling point of the DX200. 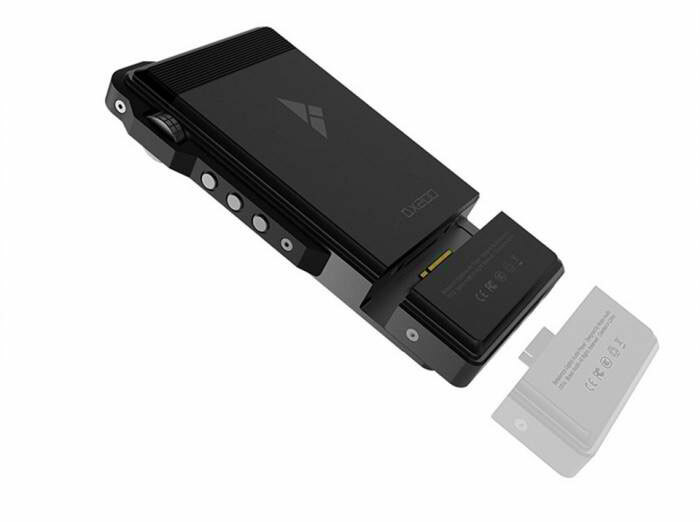 Following in the footsteps of Hifiman and FiiO the DX200 can hot swap cards and iBasso now has 2 options in the market, Amp 1 which is the stock amp card and Amp 2 which just came out a few weeks ago. Both sound different, both offer something a bit different. Out of the box though the Amp 1 card offers a lot for demanding users such as line out, single and balanced outputs. The DX200 is no shrinking violet and is one of the biggest DAP’s in the market today measuring in at 128.5mm x 69mm x 19.5mm with a fairly hefty weight of 240g. That’s 20g more than the X7 and the Opus#3 and 10g more than the AK380. Only the new Sony WM1A at 267g and its brick of a sibling, the Z1 at 455g, weigh substantially more. It is also 10mm longer than the candy bar X7 and a huge 50mm longer than the squatter single hand friendly Opus#3. 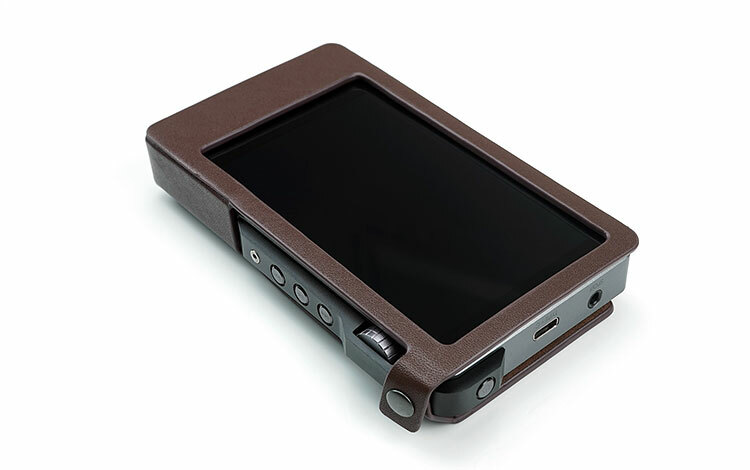 This is not a pocketable DAP, even more so when the leather case is added and so you will feel the weight in your hand more so than the competing DAPs. iBasso initially proposed 3 different designs but it was the 3rd and perhaps the most traditional design that got the nod. I say traditional in the sense of it being more realistic in terms of production lines and for use with the amp modules. 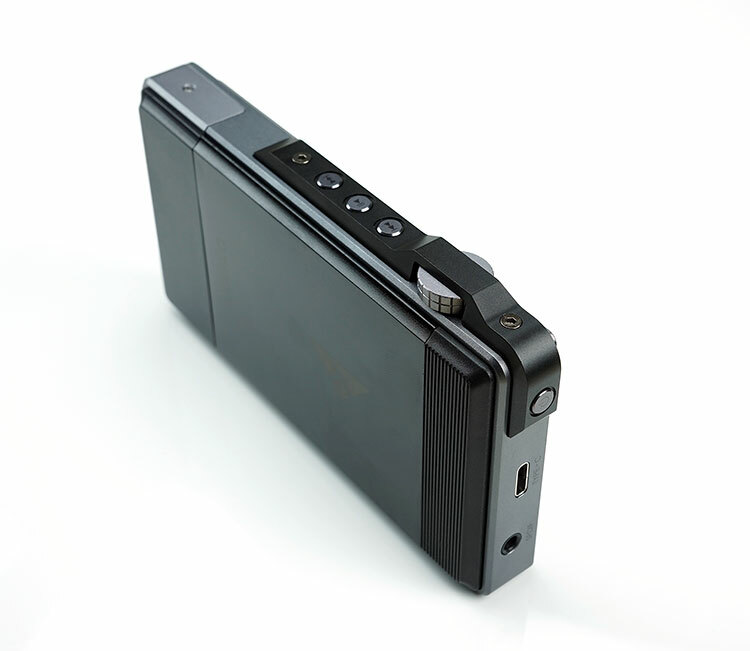 Otherwise, the design is in keeping with iBasso’s graphical designs first introduced with the DX50. There is also a certain rugged look to the DX200 with its grippy finish at the top of the back plate and volume pot as well as the industrial lines of the accented protective metal bar running over it. It is the kind of DAP I would envisage Christopher Nolan to have come up with as a response to the ‘George Lucas inspired’ clean lines of some competitor offerings. It is not quite as angular or aggressive as the DX80 but there is a certain superior refinement in the cornering and finishing that the DX80 does not have. iBasso have included a high-quality leather case with the DX200 and by and large it is a perfect fit, nothing slides out, most everything is accessible and it does feel luxuriant to the touch. It also looks pretty good and should do a good job of protecting the DX200 when out and about. However, in terms of design, there is one small flaw and that is how it overlaps on the volume dial. The dial, by the way, is not analog, but digital, though designed to operate like an analog pot so you do need to be able to access it easily to adjust volume. Unfortunately, the leather case juts out a bit over the volume pot making it a touch harder to operate the volume controls from the top down. You can get a smoother operation by operating it from underneath in one hand. It is not a huge flaw but a slightly awkward finish to an otherwise outstanding design. iBasso have not skimped either on the materials used in the DX200. The chassis is 100% CNC engraved aircraft grade aluminum with a continuance of the dual shielding cases to minimize EMI & RFI interference first introduced on the DX80. The only area I can find of plastic is the short grippy backrest which I presume is for the WiFi and BT signals to transmit properly and accurately. A good signal is harder to acquire behind a solid block of aluminum. It also seems to act as a rest for the DX200 to sit safely on otherwise slippery surfaces. This is a really good screen on the DX200, much superior to many of the sub $1k DAP screens right now. The screen used is a capacitive 4.2″ IPS Screen (768*1280) built using liquid-based bonding technology or OCA which provides for an excellent optical performance and increased durability. The screen has an excellent contrast ratio, a very wide, almost flat, viewing angle and a super sharp resolution. It is multi-touch capacitive and as of the current firmware very sensitive and fast reacting to your touch gestures. I cannot say the same for the previous firmware that didn’t optimize the screen sensitivity at all so please do upgrade to the latest firmware to get the best performance. Surprisingly just the one memory card slot up to 256GB (microSD). The DX80 and the FiiO X5iii have two memory card slots so this is something of a miss for me though it is mitigated somewhat by the 64GB of onboard usable memory that the previous mid-tier iBasso DAPs do not have. Much like the Opus#3 this could well have been one of the sacrifices at the bill of materials alter given the much costlier DAC chips and screen. Of course with Android, you can go OTG and with wireless connectivity and app management, you can also go DLNA, cloud services, and streaming so you can pull in your virtual memory and expand up to 2TB via OTG. I do miss the bi-directional BT capability from the SOC OS on the Cayin N3 and AP60 budget DAPs. I think that’s a great feature. There are a few Android apps but they seem far less user-friendly and more focused on data collation than simple audio transfer. Inside the Dx200 iBasso have packed a fairly chunky 4400mAh 3.8V Li-Polymer battery and with the Amp 1 card you get a rated spec of 8 to 10 hours which again is fairly average in terms of battery life on DAPs. Considering the dual DAC architecture, balanced output and killer screen it probably is above average. However, with button mashing, WiFi and BT on you can expect to dip below 8 hours. Average usage will see around 8 hours using FLAC and Mango OS and normal screen navigation at 50% brightness levels on the display. If you are streaming or using other apps this will vary considerably, almost as low as 5-6 hours in some cases in Android mode. Using pure Mango OS which shuts down a lot of unnecessary Android processes you will get an improved battery life of 7 hours. Charging is a touch slow at around 3-4 hours via USB 5v connections. The DX200’s modular amp system means the analog controls are housed within the amp cards at the base panel whilst the digital outputs are not hot swappable and housed on the top panel. 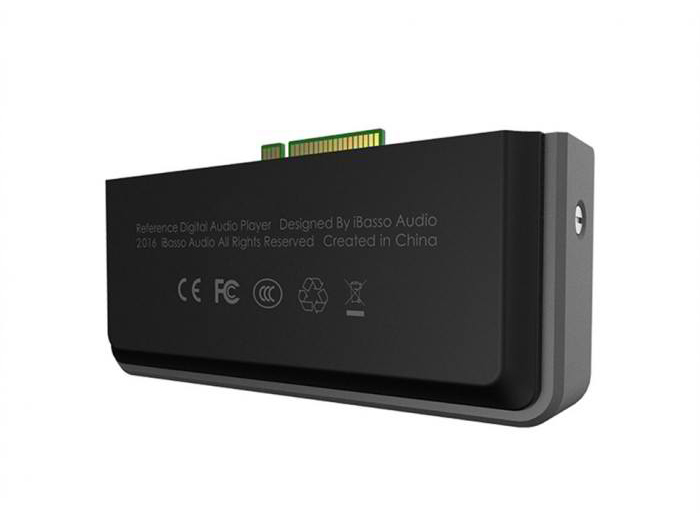 Digital outputs include a dual SPDIF coaxial and optical output for DAC duties as well as a two-way USB-C for data, charging, USB DAC and OTG services including digital audio. This is the 3rd DAP I have received in 8 months now with a USB-C port and I am starting to warm to it with its easy to insert reversible design and increasingly easy to acquire converter cables for OTG. The analog outputs on the stock Amp 1 are impressive with a dedicated line out, 3.5mm stereo jack output and a balanced 2.5mm TRRS output. 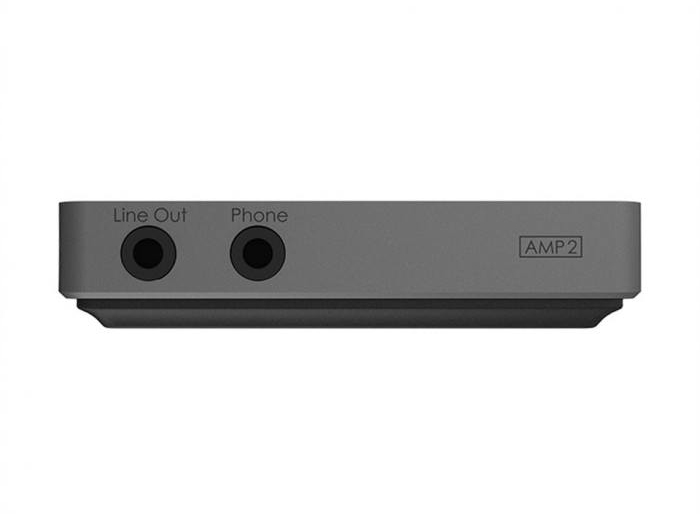 Amp 2 only has a single fixed line out and 3.5mm singled ended 3.5mm output but these have a tiny bit more power to them than the equivalent on the Amp 1 card. Whilst the DX200 is primarily a touch-based interface it does have a number of physical controls to assist in playback and volume adjustment without the need to wake up the screen and further reduce battery life. It also gives the user a “play blind” capability for quick playback control say in your pocket or by your side. Playback buttons are housed on the right side of the panel, fairly close together but tactile enough to work them without having to constantly check what you are doing. You can select FF, rewind, play, and pause as well as skip tracks from the three buttons. Just above is the physical rotary dial for volume control and is protected by the accented black metal bar which loops around the top right corner. It works in much the same fashion as an analog dial but is actually a digital potentiometer with a 150 step control inside the Android ecosystem and 200 steps inside the Mango OS. The DX200 uses the latest generation Sabre ES9028PRO chipset in a dual configuration which is the equivalent to 8 DACs in parallel for each channel (4 per channel). This chip stomps all over the AK4990 and older ES9018 in terms of technology, future proofing, and capability. Decoding wise there is a huge lift in capability from the DX80 and going beyond the current top end of the likes of the X7, ZX2 and even the AK380 with decoding rates up to DSD512 though PCM decoding is the same as the AK380 at 32BIT/384kHz. Codecs covered are wide ranging and fairly complete though there is no built in MQA processing for TIDAL fans currently. Instead, you will get everything from lossy MP3 up to FLAC, DSF, DFF and DXD at a native decoding. The dynamic range at 135dB is a good 20dB higher than the Fiio X7 and the Opus#3. The THD+N of just < 0.0002% in balanced mode and 0.00032% in unbalanced mode is lower compared to FiiO’s full desktop Es9018’s 0.0007%. SNR is more efficient on the DX200 performance at -122dB unbalanced and -125dB balanced compared to the X7’s max performance at -120dB with the AM3 module. Output numbers on the Amp 1 card are excellent with a 3Vrms rating for the single ended 3.5mm output and line out and a whopping 6Vrms for the balanced output. You will hear a qualitative difference between the two connections when switching cables, particularly on IEMs. Given the performance numbers listed you are also going to get a very good level of noise performance on efficient IEMs and solid power for headphones also. Compared to the Opus#3 the balanced output on the DX200 is 2.5Vrms higher and 0.5Vrms higher in single ended mode. For those who are looking for wattage numbers, single ended 3Vrms will provide around 2 x 1.1w on a 32-ohm load down to 2 x 123mW into a 300-ohm load for balanced and 230mW into a 32-ohm load and 30mW into a 300-ohm load for unbalanced. Amp 2 is more of an unusual beast in that it is not obviously more powerful than Amp 1 and its output numbers are not out of sync with industry norms. Amp 2’s difference is more tonal and in terms of the internal topology and signal conduction. The key pitch of the Amp 2 is the internal four-channel architecture with a current feedback buffer. Now for the general user, this pitch is not immediately obvious and no it is not a balanced output so I asked iBasso what did this all mean and what can we expect to get. “Interchangeable amps are available because people sometimes like to stack an amp with a dap, preferring the difference in tone or interaction of an amp with a particular set of headphones or IEM’s. Or they may not want to stack an amp but need something that works the best with the electrical design of their monitors. Also some drivers respond better to voltage while others need higher current to achieve their maximum performance. By having the choice of different amps with different architecture these goals and listening preferences can be met. Essentially it eliminates ground current interference by using the four channels for left and right channels and then input and output ground management. So for iBasso Amp 2 is really about the benefits of better current performance than just simply better output numbers in the more traditional fashion. The output power is a tiny bit stronger on paper than the unbalanced and line output on Amp 1 at 3.2Vrms compared to 3Vrms but it is not hugely significant. Instead, the AMP 2 is really going to boil down to how black you like your background and tonal preference because it does sound a bit more musical than Amp 1. Those familiar with the amp module swapping process on the FiiO X7 will easily get to grips with the changing amp cards on the DX200. Thankfully the Amp 2 card comes with a small straight screwdriver, unlike FiiO which supplies the screwdriver with the DAP. You simply power down the DX200, take out the two tiny screws on either side of the amp card 1cm from the bottom, gently pull out the card and insert the replacement card. You then screw it all back in and reboot the DX200. Much like the X7, you can hot swap the amp cards without turning off the DX200 though it is not recommended. The packaging on the DX200 is gorgeous actually. It is intricate, well designed and well packaged. The outer box sits vertical, resembling almost a desktop PC in some ways. It slides open upwards revealing the DX200 attached to a design board that you can easily lift out. Underneath you have a carefully arranged quantity of fitted cardboard boxes containing manuals, accessories and of course the leather case. 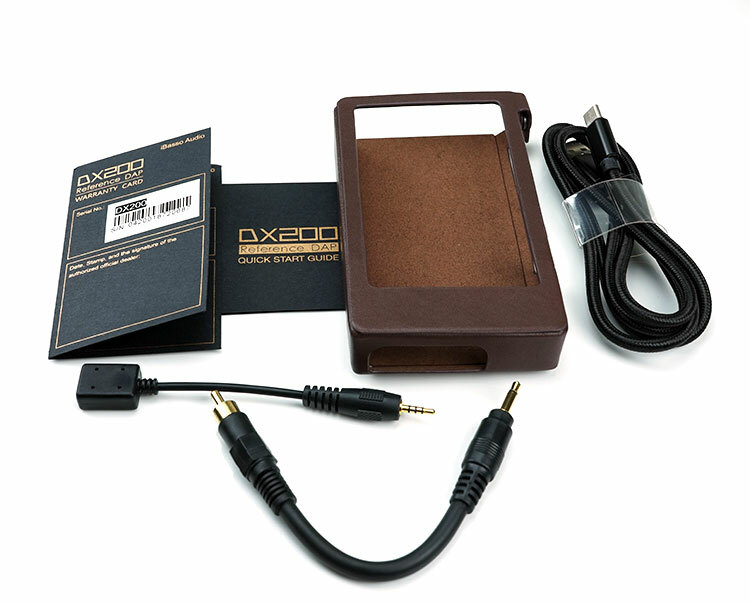 Accessories for the DX200 include a quick start guide and warranty card as well as iBasso’s standard burn in cable, a 3.5mm to coaxial converter cable, a USB-C to USB-A data/charging cable and the brown leather case. Out of the box, the DX200 also comes with a screen protector already pre-applied with a peel away tab at the right top (marked no 2). Simply peel back using the tab as your guide and it will lift the top layer off and leave the actual screen protector in place covering the entire screen. It is a small touch but an important one because those things can be the devil to apply and avoid bubbles. 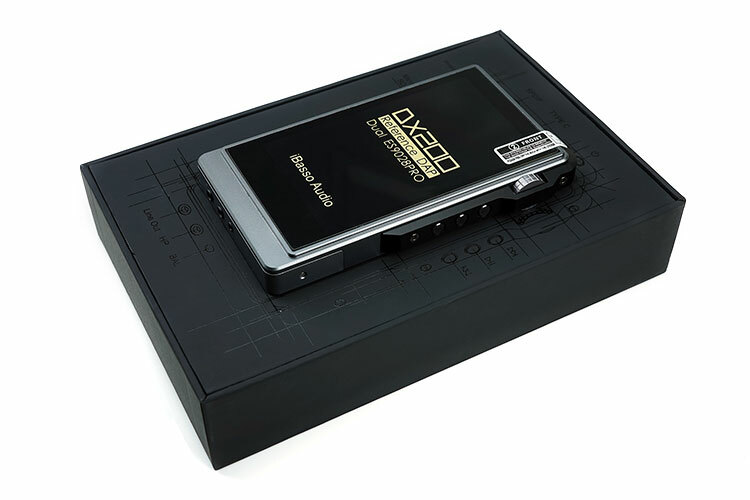 The Amp 2 comes in its own small box as it is sold separately to the DX200 on the iBasso and distributor websites. No, I will look at that today. I will research that. I was considering maybe the Questyle QP2R, or maybe the A&K SE100. My logic for going with the F7 mkII was the clarity and detail on the highs, coupled with the great bass detail, etc. But as I sit here enjoying my music I can’t help but feel the highs are a tad ‘glaring’. Coming from the AK Jr., I got used to that smoother high end, and I feel that is what I should stick with. But again, I love the F7’s detailed, rumbly, punchy bass. I have the black tuning tube installed on the SE846’s, and that extra bass really comes alive. I’m wondering if that trebly glare I’m hearing will resolve once the F7 is burned in some more. It seems like the soundstage is settling down and it sounds a bit deeper than previous, so ill give the F7 another week or 2 before I decide. I really appreciate your continued feedback! Have you though about changing the amp cards around first? Welcome back Steven, we chatted on the X7ii review also. Do you love it or it being returned because the deal breaker on the staging? I am a little confused. Disappointing there was no discussion on sound stage. I recently bought the Fiios x7 mkII and I love it, the only thing the sound stage is wide, and I suspect tall, but not deep at all, rather 2 dimensional. And that’s a bit of a deal breaker for me. I like to get the DX 200 and I have the mojo can I use the DX 200 as a player plug in the mojo using as DAC into my stereo system ? I still have the first I- basso player DX 50 I guess in the meantime lots of improvements have taken place ! You can use the SPDIF out of the DX200 to the Mojo but I am not sure if you need that. The DX200 is higher end than the Mojo for me in terms of DAC specifics. If you want to use the Mojo just buy a very cheap DAP and use it as a transport connected to the mojo and jack into the Mojo. Hi Marcus, I’ve purchased the DX200 and still use my old Sennheiser HD 600 headphones. With the default AMP1 the sound is a bit thin. I used the mini coaxial cable to connect from SPDIF into the coaxial ‘digital in’ of my TEAC UD-H01 DAC. With the phones plugged into the TEAC I have a full, warm, ‘perfect’ sound. Now I’ve read in Michael’s TOTL Guide (18.08.2014) that the Sennheiser HD 800 is ‘picky’ regarding amplification needs. Could this also be true of the HD 600? Would iBasso AMP2 or AMP3 make any difference? Also, with the mini coaxial cable, am I actually converting digital to analog in the TEAC and thus bypassing the excellent dual ESS ES9028PRO DAP chips in the DX200? (That would be a waste of good money.) Finally, can you recommend headphones for the DX200 (without use of an external headphone amplifier)? Many Thanks! The DX200 is quite neutral and transparent and so is the HD600 in many respects so this maybe part of the reason why you get a slightly neutral sound. The thinness might be contextual in that you have heard something warmer and fuller from the TEAC. The DX200 power is good but it’s not desktop power. 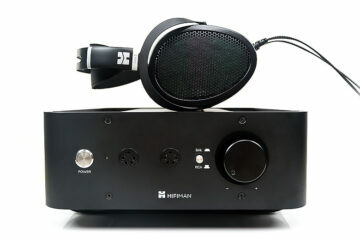 For me, picking a decent headphone that will give you plenty of oomph would be either an AKG K812/K872 or a Hifiman Edition X and further down the scale a MrSpeakers AEON and Audeze SINE. I purchased the Hifiman Edition X and yes, the sound is beautiful with the DX200. I then obtained the Hifiman symmetrical Crystaline cable. Using an adapter to TRRS 2.5 mm this really sounds fantastic on the AMP1 – you can tell the difference. As I may buy the AMP4, I purchased an adapter to TRRRS 4.4 mm but on measuring the electrical connections they are clearly not balanced: Left (T), Ground (R), Right (R), Ground (R), Ground (S). So I wonder if anyone can confirm that AMP4 requires a TRRRS plug and with what electrical connections? 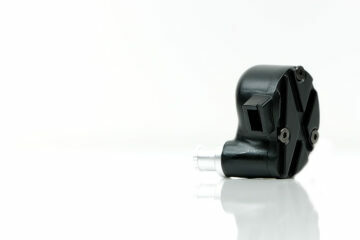 I received a fast response from iBasso: the AMP4 4.4 mm TRRRS plug specification is: L+(T), L-(R), R+(R), R-(R), unspecified(S). GREAT SOUND = iBasso DX200/AMP1 with HiRes audio or vinyl recordings *plus* Hifiman Edition X v2 headphones. 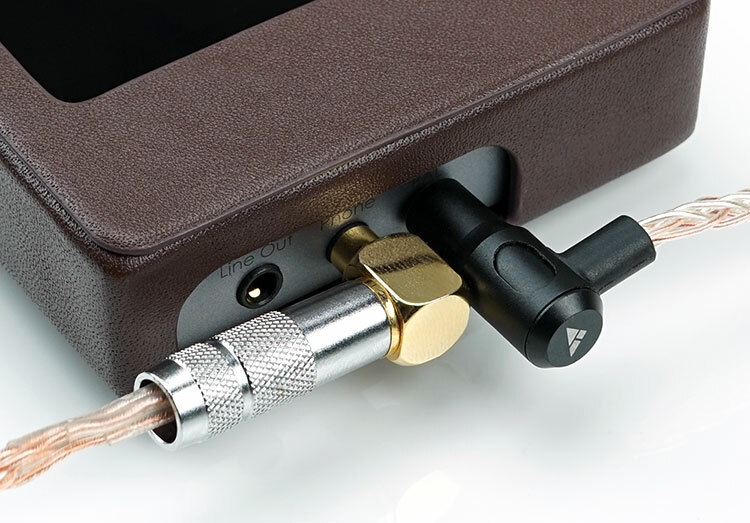 SUPERB SOUND = as above *plus* Hifiman Crystalline Balanced Cable (3.5 mm TRRS plug) *plus* a 3.5 to 2.5 mm Adapter. I’m convinced… the difference is really noticeable. PERFECT SOUND = as above but with AMP4. The problem: 4.4 mm plugs and adapters are practically unknown in Europe. My first attempt failed as a “geekria Apollo 3.5 mm female to 4.4 mm male” adapter advertised in Amazon as ‘Balanced‘ had three poles electrically shorted together within the adapter itself so it could only function as an unbalanced adapter. The solution I found in Amazon.co.uk: “Meijunter 4.4mm (Male) to 3.5mm (Female) Balanced Cable Plug Adapter for Sony PHA-2A/iBasso/Fiio/HiFiman Headphones”. This adapter has no shorted connections and functions just fine as a TRRS to TRRRS balanced adapter. I was initially sceptical if I’d notice a difference using AMP4. But the sound is awesome! It’s hard to describe… it’s powerful and clean, harmonious and it sounds as if I am listening to vinyl records on an amplifier with KT88 tubes. I’m delighted with the level of sound perfection I have reached and consider it a bargain at the price. Thank you for your very helpful reviews… maybe you’ll cover AMP4 too soon. Sorry Andrew for the late reply, your post got stuck in our spam queue. Yup, we most certainly will be reviewing both the 4 and 5, it is just in the middle of a crazy queue right now of products we have on our desk. Marcus, i have the DX80, how’s in terms of SQ? And with Chord Hugo? Huge upgrade in sound, a lot more neutral and revealing than the DX80. Never compared it to the Hugo, very different market segment and usage scenarios. We never tested the AK Kann but to be honest I would take a dual ES9028PRO implementation any day of the week over the KANN’s use of the same chip out of the budget AK300 – a single AK4990 (old, cheap). The detail on both are very good actually but you will find the low end of the Mojo to be that bit more planted and weightier. Depends on your listening preferences and usage scenarios. The AK is a DAP, you do not need anything else apart from earphones so listen to music. The Mojo requires a source such as PC or smartphone or another DAP. In terms of power the Mojo is superior and more suitable for headphones, AK240 is a neutral , clean sounding DAP more suited to sensitive IEMs. 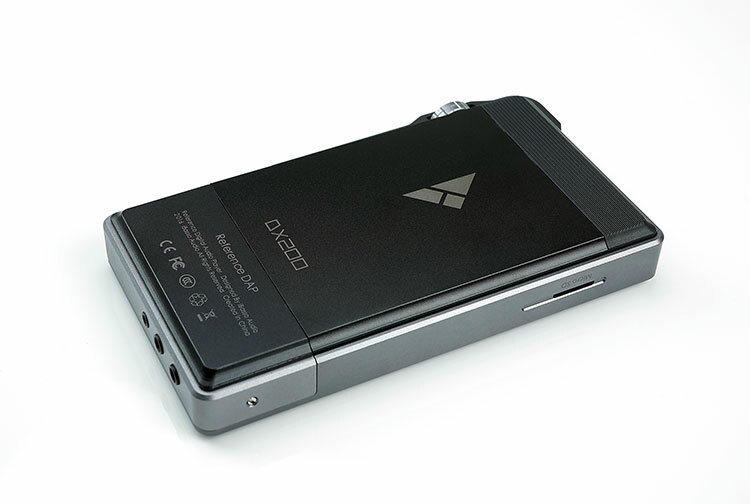 FiiO X7 Mark 2 uses the same dac, but only one of them so I will find some similarities to the dx200 though the AM2 and AM5 cards sound more to your taste. i too would like to know if it’s possible to use an App on my smartphone or tablet to access the music on the player as I plan to have the DX200 connected to my HiFi . Has anyone been able to do this and if so how ? marcus….any thoughts of the ibasso dx200 sq vs the mojo, please>? That I am not too sure. However, since it is Android 6.0 perhaps you can sideload a universal remote app or perhaps a DLNA server app that can transmit to your Hi-fi setup? Very Good!! Thank you for the effort you put into this for me. Looks like I have mostly MP3 and Flac in Hi-Res. I do have m4a will they work?? I hope so since I have so many of them. Thanks!! I have a Pono player and all my files are in the Pono library. I am kind of new to this. Can I use my files and SD cards with the Ibasso? Thank you for all the help!! APE, FLAC,WAV, WMA, AAC, ALAC, AIFF, OGG, MP3, DFF, DSF, DXD. I just realized it is for Android. Not for me. Why don’t they make one for IOS? Very disappointing!! There is not a single DAP on earth that will ever be made with iOS as its operating system. For that you have to buy an iTouch. Did I miss it or is the price mentioned? How much is this beauty?? Yup price and link to iBasso is above our score :) Buy direct, you will pay a lot more on Amazon. If I use the DX200 as a DAC for my PC, will the amp of the DX200 work? Why no more than 92 points? That’s a pretty outstanding score as it is. I wonder how DAPs will sound in 5 years time, better maybe than all the ones now? All are side-grade and you can’t do any better technically, all sound really good, for me at this level of tolt is more important the pairing with your headphone. If you want to see the future of daps, you can see the desktop dacs, or no? Sorry I am not sure what you mean by your last sentence. You mean future of DAPs is desktop? Technology being what it is, today’s gear is ‘yesterday’ in a few months, much like smartphones. Q1r have 94 points, in what way is better the q1r? Different reviewer did the QP1R, and its overall score is lower.